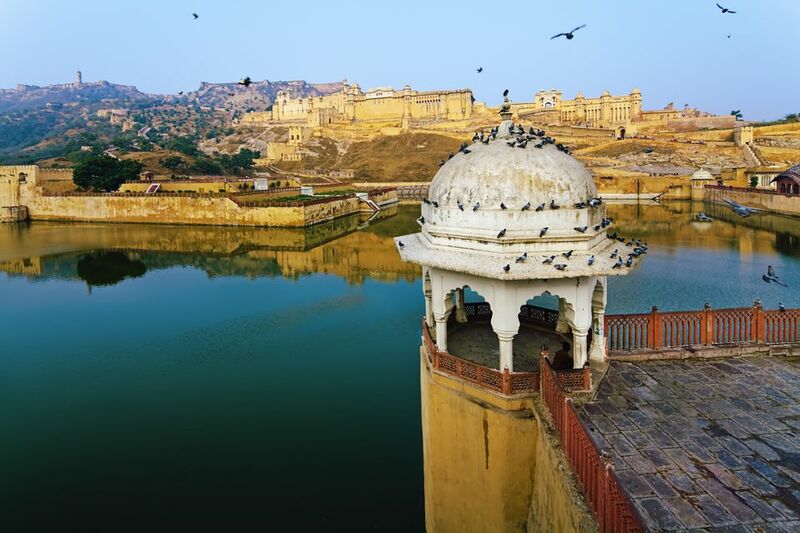 Nostalgic Amber Fort, near Jaipur in Rajasthan, is one of the most well-known and most-visited forts in India. Not surprisingly, it features prominently on the list of Jaipur's top attractions. Here's what you need to know to plan your trip. Amber was once the capital of princely Jaipur state, and the fort the residence of its Rajput rulers. Maharaja Man Singh I, who led Mughal Emperor Akbar's army, commenced its construction in 1592 on the remains of an 11th-century fort. Successive rulers added to Amber Fort before moving the capital to Jaipur in 1727. The fort was declared a UNESCO World Heritage site in 2013, as part of a group of six hill forts in Rajasthan. Its architecture is a noteworthy fusion of Rajput (Hindu) and Mughal (Islamic) styles. Made out of sandstone and marble, Amber Fort consists of a series of four courtyards, palaces, halls, and gardens. At its entrance lies the primary courtyard, known as Jaleb Chowk. It's here that the king's soldiers assembled and paraded themselves around. Suraj Pol (Sun Gate) and Chand Pol (Moon Gate) lead into this courtyard. Easy to miss, to the right are some small steps leading to Shila Devi temple. It's open from 6 a.m. until noon, and again from 4 p.m. until 8 p.m. Sacrifices were part of the temple rituals, as the goddess is an incarnation of Kali. Legend has it that human heads were originally offered to the goddess before she was persuaded to accept goats! Head inside the fort, up the stately staircase from Jaleb Chowk courtyard, and you'll reach the second courtyard that houses the Diwan-e-Aam (Hall of Public Audience) with its many pillars. The third courtyard, accessed through the ornate mosaic Ganesh Pol, is where the king's private quarters were located. It has two buildings separated by an expansive ornamental garden. It's here that you'll marvel over the fort's most exquisite part -- the Diwan-e-Khas (Hall of Private Audiences). Its walls are covered in intricate mirror work, using glass imported from Belgium. Hence, it's also called Sheesh Mahal (Hall of Mirrors). The upper part of Diwan-e-Khas, known as Jas Mandir, has delicate floral designs with glass in them. The other building, on the opposite side of the garden, is Sukh Niwas. A place of pleasure, it's where the king reportedly relaxed with his ladies. At the rear of the fort lies the fourth courtyard and Palace of Man Singh, which has the zenana (women's quarters). One of the oldest parts of the fort, it was completed in 1599. It has many rooms around it where the king kept each of his wives and visited them when he wished. At its center is a pavilion where the queens used to meet. The courtyard's exit leads down to the town of Amber. Unfortunately, the king's bedroom (near the Sheesh Mahal) remains closed. However, you can sometimes buy a separate ticket (from inside the area where it's located) to see it. Its marvelous ceiling is covered in small mirrors that give the impression of a starry night when a candle is lit. Amber Fort also has an open-air passage that connects it to Jaigarh Fort. Tourists can walk along it from Ganesh Pol, or be transported by golf cart. The fort is situated about 20 minutes northeast of Jaipur. If you're on a strict budget, take one of the frequent buses that depart from near the Hawa Mahal in the Old City. They're crowded but will only cost you 15 rupees (or 25 rupees if you want air-conditioning). Alternatively, it's possible to take an auto rickshaw for about 500 rupees for the return trip. Expect to pay 850 rupees or more for a taxi. Amber Fort is also included on the itinerary of the Rajasthan Tourism Development Corporation's inexpensive full and half day city tours. Amber Fort is open daily from 8 a.m. until 5.30 p.m. To reach the entrance at the top, you can either walk uphill, ride on elephant back, go by jeep, golf cart, or take your vehicle. However, do note that it gets very busy during the tourist season and traffic jams are common. Many people choose to remain at the fort for the evening sound and light show, night viewing, and dinner. The fort reopens, evocatively illuminated, from 6:30 until 9:15 p.m. While inside the fort, it's worth eating at 1135 AD for the opulent regal ambiance. This fine dining restaurant is situated on level two of Jaleb Chowk. It's open until 10:30 p.m. and serves tasty authentic Indian cuisine. You'll really feel like a maharaja there! October to February (tourist season): English 6:30 p.m. and Hindi 7:30 p.m.
March to April (summer): English 7 p.m. and Hindi 8 p.m.
May to September (monsoon): English 7:30 p.m. and Hindi 8:30 p.m. If you're interested in the art of traditional block printing, don't miss the Anokhi Museum near Amber Fort. You can even take part in a workshop. Ticket prices increased substantially in 2015. The cost is now 500 rupees for foreigners and 100 rupees for Indians during the day. Composite tickets, costing 300 rupees for Indians and 1,000 rupees for foreigners, are available. These tickets are valid for two days and include Amber Fort, Nahargarh Fort, Hawa Mahal, Jantar Mantar observatory, and Albert Hall Museum. Admission to Amber Fort at night costs 100 rupees for both foreigners and Indians. Discounts on ticket prices are available for students, and children under the age of seven are free. The ticket counter is located in Jaleb Chowk courtyard, across from Suraj Pol. You can hire an audio guide or official tourist guide there as well. Alternatively, tickets can be purchased online. Tickets for the sound and light show cost 295 rupees per person, including tax, for both the English and Hindi shows. They can be purchased at various places including at the fort, Jantar Mantar, and Albert Hall Museum. If buying tickets at the fort, try to get there an hour before the show starts to ensure availability. A popular way of reaching the top of Amber Fort is to ride on an elephant from the car park to Jaleb Chowk. However, due to concerns over the welfare of the elephants, some tourists are now choosing not to do this. If you do go ahead with it, expect to pay 1,100 rupees per elephant (which can carry two people at a time). The rides take place in the mornings from 7 a.m. until 11.30 a.m. There used to also be afternoon rides. However, these were stopped in November 2017, so the elephants could rest. Be sure to arrive as early as possible to get one, as demand is high and it's not possible to book in advance. Joyrides on Segway scooters have been introduced at Amber Fort. The tours run from 11 a.m. until 1 p.m. every Sunday, Monday, Wednesday and Friday.